The Regional Services Department of the Ministry of Public Health (MOPH) in hosting its final capacity-building workshop for 2018, sought to educate Regional Health Officers (RHOs) on decentralizing healthcare delivery across Guyana. The exercise, which ran for two days from October 31, was designed for RHOs, medical superintendents and other senior medical personnel across the region. 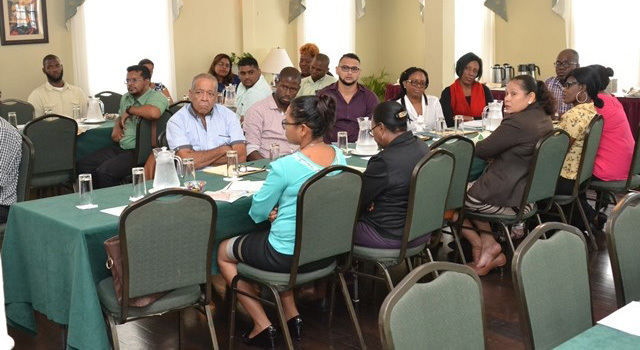 The workshop ran under the theme “Collaboratively, we build a resilient healthcare system that is acceptable, accessible, timely and appropriate to meet the needs of every person in Guyana”. According to the World Health Organization (WHO), more countries are embarking on decentralized healthcare systems as a means to improve responsiveness and performance and as such, Guyana is seeking to implement this aspect into its system, which in turn may greatly affect the delivery of healthcare countrywide. Healthcare decentralization is geared for increasing local authority to implement results-based management. It is also to enforce local accountability for obtaining responsiveness, towards ensuring greater equity and improved health outcomes. Director of Regional and Clinical Services, Ministry of Public Health, Dr. Kay Shako, reiterated to those at the workshop that a transformation in one’s attitude and behaviour was pertinent to the process of improving healthcare delivery. The sessions covered knowledge shared in supervisory management, policies and public service rules and budgeting, financing and auditing in health care. Senior Public Health Administrator, Region Ten Regional Health Officer, Dr. Pansy Armstrong also shared their practical experiences as RHOs with the gathering. After attending the workshop, participants are expected to return to their respective regions and ensure that what they learnt has been filtered down, motivating others outside the system to join and contribute to the overarching vision of the Ministry of Public Health.